Content delivery technology is not usually the first consideration when planning a digital-out-of-home (DOOH) or digital signage network. Choosing the environment, location and purpose come to mind first, followed by content themes, dwell times, software GUIs and ROI. Next on the list are displays, mounts, installation considerations, financing and ongoing system management. And don’t forget about advertiser meetings, content suppliers, and advertising sales and staffing issues. Connectivity is usually an oversight or seen as low priority. However, content delivery methodology is one of the most import logistic parameters. You can have the best DOOH technology and most engaging content, but if the system is playing outdated content due to connectivity and delivery problems, you’re in trouble. In most cases, the connectivity issue is an afterthought and “whatever is currently available” in the venue is utilized. Sometimes this is due to the small initial size of the fledgling network. In other cases, it is to save on the cost of a dedicated network. Speed, quality and cost must be the determining factors in selecting the appropriate delivery network. As the size of the network grows or the existing connectivity infrastructure clogs, other alternatives are investigated. Additionally, the venue or IT group may not want to allow a third party to access their LAN/WAN. This is especially true in organizations that use the network for secure communications, such as POS/transactions. Dedicated circuits, such as DSL or cable, provide a better level of reliable content delivery connections than sharing existing networks but they also incur a substantial recurring cost per site. Usually, the cost of dedicated terrestrial IP connectivity for a business connection starts in the $80 per site/per month range. • For 100 locations at $80 per site equals $8,000 per month. • For 500 locations at $800 per site equals $40,000 per month. • For 1,000 locations at $80 per site equals $80,000 per month. Certain wireless technologies may be overlooked because of the preconceptions of capacity or costs. In this instance, we refer to cellular and satellite technologies. Most of the cellular plans available for IP content delivery have caps at 5 GB. Substantial overage charges apply if the traffic exceeds the plan cap. However, using broadcast satellite is a fixed-cost solution. The total required throughput is established, and a fixed cost is applied. There are no surprise charges. Some satellite plans allow for a pre-determined “burst” schedule as well. This type of satellite delivery method is used in many applications, such as streaming and file delivery for in-store music, business television and other corporate communications. In some of the DOOH/digital signage applications a return or “back channel” is required. Normally this traffic is very infrequent and requires a low data rate. 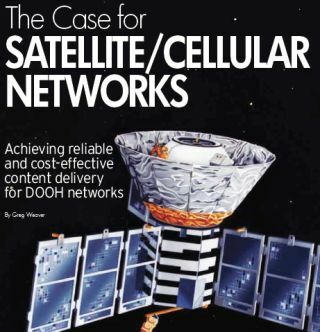 A hybrid network utilizing satellite for the “heavy lifting” or bulk content delivery and a small cellular data channel return is an economical and reliable alternative that is readily available nationwide. Once the network has the connectivity architecture in place, distributing within the venue to the “last foot” is the final piece. There are a number of LAN distribution products available off the shelf that are very cost effective and reliable. Also, local distribution to multiple points wirelessly via 802.11 platforms offers easy and secure connection. A limited number of network operators offer all the above in one device. This combination of satellite, cellular and 802.11 technology in one box can greatly reduce the complexity and cost of multiple devices. Currently a number of networks, from 50 locations to more than 2,500 locations, use this type of network. A budgetary cost example for a 250 site network supplying more than 40 GB of content to a site with 100 Kb per day return channel is $30 per month. That is a savings of more than $50 per month per site when comparing to traditional terrestrial only circuits. This totals to a $12,500 per month savings for the network plus a much higher total monthly throughput. As more sites are added, the monthly cost continues to be reduced because of the fixed cost of satellite. Still, some operators may be hesitant because of confusion surrounding satellite technology. Utilizing a satellite services provider that has many years of experience and a large, established installed base will ease technology issues or concerns. In addition more and more cellular providers have partnered with satellite broadcast providers and can offer these hybrid solutions as well. It is never too late to transition to a satellite/cellular network. All equipment is available off-the-shelf, and there are thousands of qualified installation technicians nationwide. Whether you have 50 locations or 5,000 locations, a hybrid network can be implemented in days and can save money each month.